Made this Serial LCD using an Atmega8 the arduino bootloader and some code. The design of the schematic came from sparkfun (Jimbloom). I had to make some modifications to the connections to give less soldering and those changes can be found on the arduino software. The original sparkfun firmware was upgraded by s ridenour and can be found here. This improved software allows user defined characters, displays the baud rate that has been set (easy to forget) and still allows the functions from the previous firmware, such as user programmable splash screen and all the cursor and screen manipulation stuff that the controller allows. This is a small program to talk to the device from an arduino. // Clear the display and say "Hello World!" // the other example code available on the tutorial page. // for the display. This prevents display corruption when uploading code. The firmware you can view below and download from here. display cursors and other functions. me a beer in return. 03/08/11 - Splash screen prints the baud rate, in case you messed up. 9/29/10 - Added support for 20x4, 16x4 and 20x2 LCDs. in EEPROM and retained upon loss of power. for their fantastic work on this library! 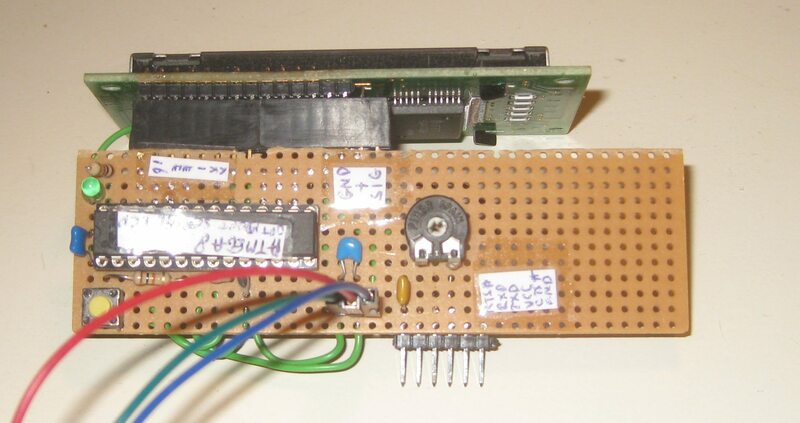 screen displayed (or not) according to the EEPROM states. SpecialCommands() is reached if SPECIAL_COMMAND is received. // sends them one at a time via Serial.print(somebyte, BYTE) or somesuch. manipulation on Cursor, if it is beyond the screen size. value is written to EEPROM. a baud rate setting balue that should be between 0 and 10.
is out of bounds 10<baud<255, no action is taken. 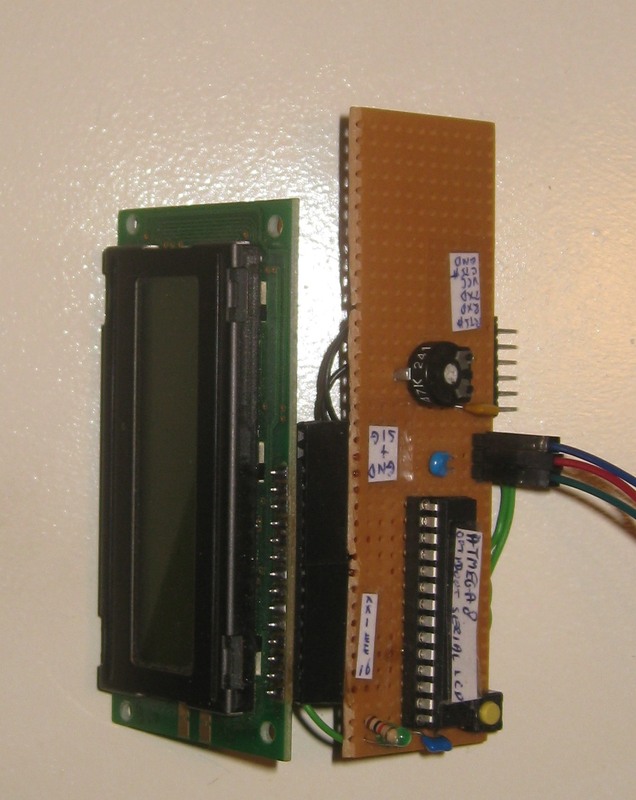 The above pictures show the prototype serial LCD . After this i designed a small PCB which has the same functionality. When this has been properly tested it will be available in the shop. 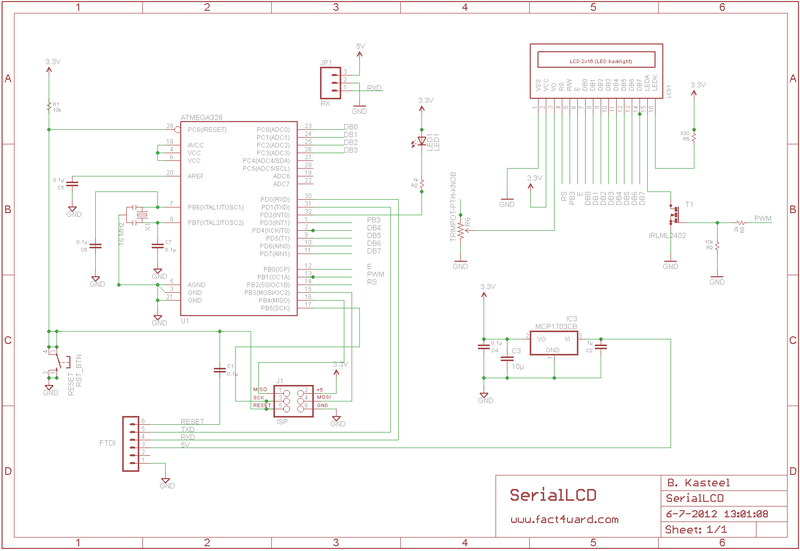 In the mean time you can view the serial LCD schematic and layout designs. In the mean time here is the design.